Below you will find the most Frequently Asked Questions related to Dream of Mirror Online. For all other troubleshooting questions, please send a ticket to Customer Support. What is Dream of Mirror Online? 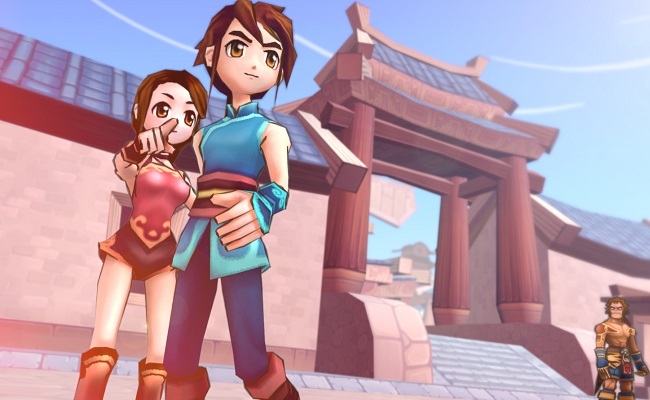 Dream of Mirror Online (DOMO) is a beloved social anime MMO based off of Chinese mythology that features several features as well as customization options that captivated the hearts of thousands of fans! DOMO features a flight system, a complex but flexible job system, a fun and satisfying pet raising system, a very deep crafting system, plenty of costumes and other character customization options. Can I play as a male character? Can I play as a female character? Yes and yes! You can choose to play as a male or female character with any race and class that you wish to play as and customize yourself with numerous hair styles and facial features. Can you actually get married in the game? Can you use WASD to move? Yes, players have the options to choose between using WASD keys or arrow keys. Players can also automatically move by holding the mouse button down and clicking on a spot on the map. How do you navigate the game world? In DOMO you have the unique ability to traverse the world by flying on your weapon of choice. Is Dream of Mirror Online primarily a grinding or questing game? Dream of Mirror Online has the best of both worlds. It has a TON of quests to complete that can encourage you to work with a team up to 6 people and has initiatives for level grinding that help you build on your job specific skills. Everyone starts out as a commoner. When you reach level 10, you get to choose between (13) different jobs. The unique thing about DOMO is that you can go between any of these 13 jobs freely, and you will have the ability to use two jobs at once through the subbing system! DOMO has both physical and magical classes. Doctor, martial artist, shaman, wizard, and blademaster are some of the jobs you will get to choose from! Is there PVP or specific battle areas? Yes! DOMO features a dueling system and an arena, where you can duke it out in teams or alone in several different battle styles! Can you have multiple characters per account? Yes, you can have multiple characters per account. What equipment is available in Dream of Mirror Online? There are a variety of staffs, daggers, wands, syringes, fans, and swords -- to name a few. In Dream of Mirror, you will have the opportunity to choose from a variety of pets, all with different elements. The pets start as eggs, and, through battling alongside you, will grow up into fierce competitors! Are there guilds in the game? Yes all you require is a team of 6 people without guilds and 40k gold in-game. Can you play with people from all over the world? Yes, we have players from all over! You’ll have the chance to make friends worldwide! Our current max resolution is 1680 x 1050 (with the option to drag the windowed version to be as large as you want), but this could change with the next version we receive! Does this game support Windows 7 (64 bit)? Yup! You’re good to go! What are the minimum requirements necessary to play?